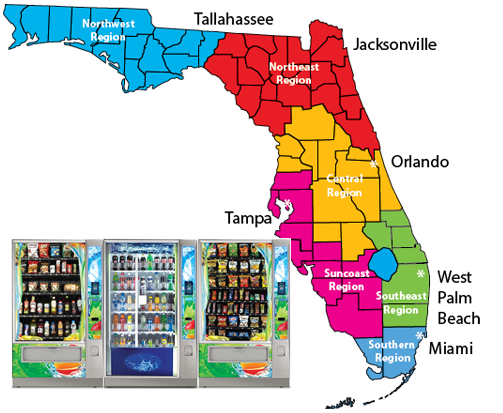 Global Vending has been proudly serving superior breakroom refreshment to Central and South Florida for over 35 years. Searching for the best break room refreshment specialists? Look no further. 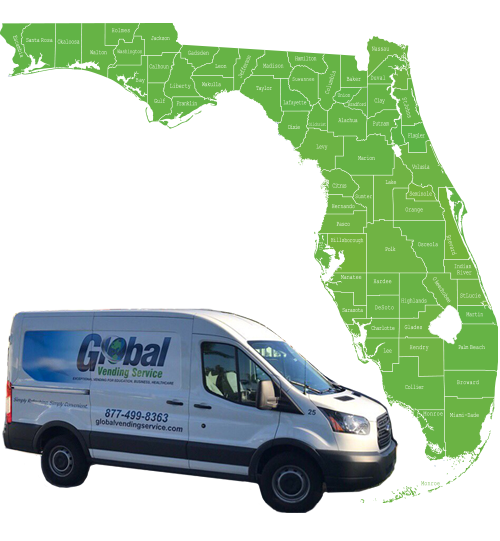 Global Vending provides unbeatable snack, food and beverage variety in the Central and South Florida area! Plus, our programs are specially customized for your specific location whether it's a self-checkout breakroom or a focus on corporate wellness with healthier selections. If you have offices in Miami, Fort Lauderdale, Sarasota, Tampa or elsewhere, we can be your go-to vending services provider for all locations. Choose Global Vending Service for your vending needs. There's no risk, only reward with service from Global Vending. Find out more today by calling 877-499-8363 (VEND). Require a State-Wide Contract? No Problem! Need vending across all of Florida? Statewide vending contracts are available! If you have locations in Tallahassee and Jacksonville, down to Tampa, Sarasota, Miami or elsewhere, we can be your go-to vending services provider for all locations. Find out how we can provide service across the entire today of Florida by calling 877-499-8363 (VEND).